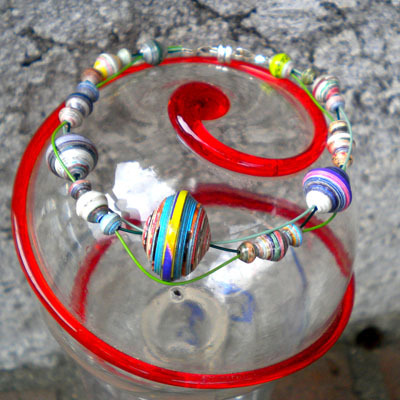 I see how you like the Beads In Orbit bracelet, and some of you have decided to make this type of design for the bead trade. Here’s is another example using three beading wire instead of two and I am calling it Saturn’s Moons in paper beads and a video tutorial of Kayla showing you how. 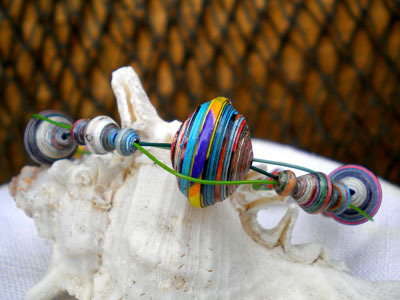 The video shows you how to make this bracelet using the two strand method. Like I said on previous posts, I will continue to feature different designs to give you ideas and then we will decide (by vote!) which one we will be making for the trade on October 23rd. is it possible to get written instructions? 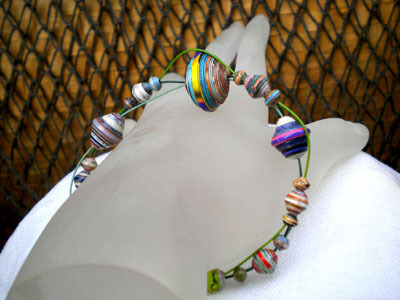 I finished my Beads In Orbit bracelet! I will try to send pictures later! Awesome video Kayla! You’ve made this easy for me to understand! Thanks! I’m definitely going to make this. Very pretty, maybe I will use this style!